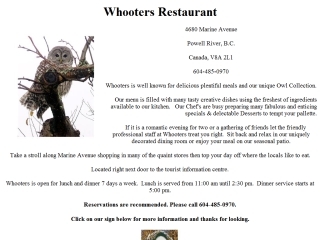 Whooters is well known for delicious plentiful meals and our unique Owl Collection. Our menu is filled with many tasty creative dishes using the freshest of ingredients available to our kitchen. Our Chef's are busy preparing many fabulous and enticing specials & delectable Desserts to tempt your pallette.